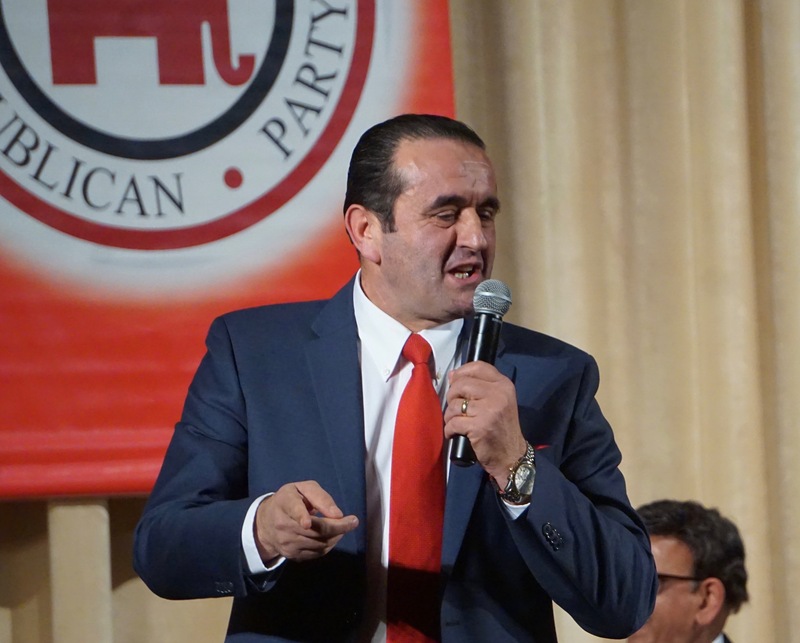 Peter Lumaj at a recent GOP candidates’ forum. The Trump administration declined Wednesday to confirm or deny Republican gubernatorial candidate Peter Lumaj’s account that he rejected an offer after the 2016 election to return to his native Albania as the ambassador from the United States. “We cannot comment on personnel decisions that may or may not have occurred,” said Helen Aguirre Ferre, the White House director of media affairs. Lumaj enthusiastically recounted the Trump administration’s interest in his services Monday night in an appearance before the Republican Town Committee in West Hartford, but he quickly turned circumspect when pressed for details by reporters as he was leaving. But Lumaj declined to take questions by phone on Tuesday and again Wednesday, insisting that all questions be emailed. “Just put it in writing,” he said. 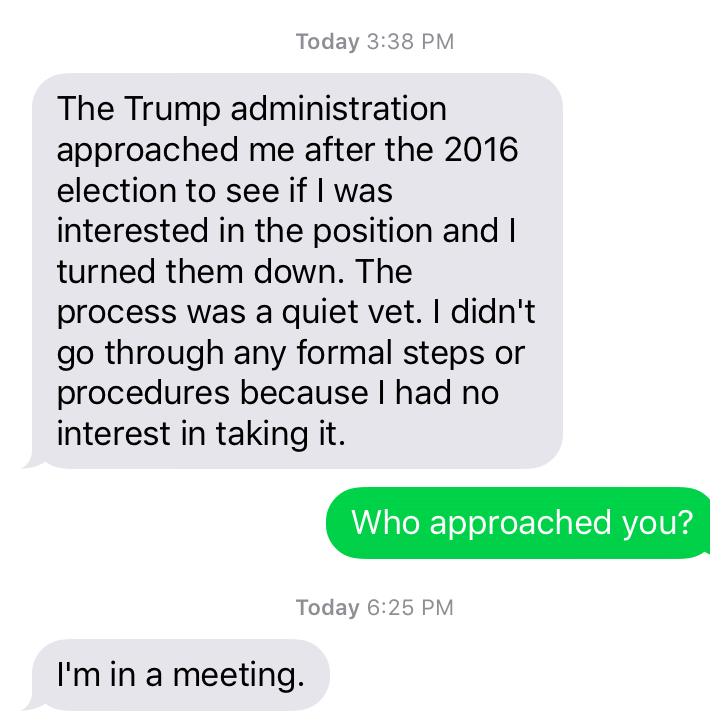 A text message exchange with Peter Lumaj. CT Mirror posed a half-dozen questions, including: When did this occur? Who made the approach and how? You mentioned vetting — how far did that go? At what point did you say you were not interested? His response came in a text message. 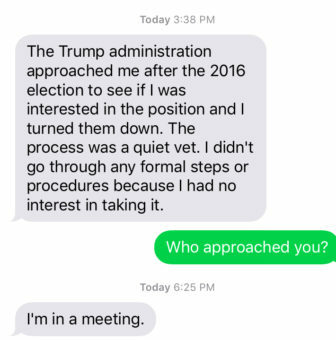 He declined further comment, either by phone or text. According to the State Department web site, the current U.S. ambassador to Albania is David Lu, a career Foreign Services officer who has bachelor’s and graduate degrees in international relations from Princeton and speaks seven foreign languages, including Albanian. He has held the post since Dec. 17, 2014. Lumaj is not a member of the Connecticut bar, but he has an LL.M, a master’s degree in law, from the Benjamin N. Cardozo School of Law, which allows him to appear in immigration courts. He is a member of the bar in the District of Columbia. Lumaj’s stump speech details his fleeing from Albania as a young man, coming to the U.S. as a refugee and settling in New York City, where he worked as a doorman and attended the City University of New York and Cardozo. He lives in Fairfield with his wife and three children, commuting to New York, where he says he has real estate interests and represents immigrants. Among the GOP candidates for governor, Lumaj is the most vocal supporter of Trump. He endorses the president’s tough stands against immigrants in the country illegally.